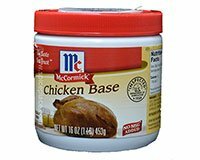 As of December 2016, this McCormick Chicken Base has been discontinued by McCormick and Co. We still offer a similar item Tones Beef and Chicken Soup Bases. Use for soup base or as a replacement for salt. Great for poultry gravies, dips or to cook with rice. Makes approx 5 gallons. No MSG added. Refrigerate after opening. McCormick Real Chicken Base is a Soy Free product. Serving Size: 1 tsp (6g) Sodium per serving: 850mg. Get the Combo! 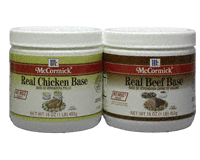 Get both McCormick Beef Base and McCormick Chicken Base together and save more! Ingredients: Chicken, Salt, Maltodextrin, Chicken Fat, Lactic Acid Powder (Latic Acid, Calcium Lactate), Flavorings, Disodium Inosinate and Disodium Guanylate, Dehydrated Onions, Turmeric, Natural Flavorings.